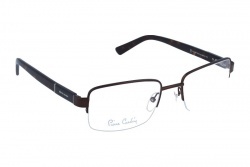 Pierre Cardin frames are characterized by its avant-garde style and its classic designs. Its glasses are designed to fulfill the demands of fashion through sophisticated models. Cardin's inimitable style extends into his premium range of luxury prescription glasses, which are gracefully shaped, yet entwined with modern design principles. The materials which basically compose the rim are acetate and metal. Attractive brand flourishes are unique to each individual pair in this collection, including laser etched chrome (as well as other metal embellishments), Swarovski gems, intricate patterns and the prestigious Pierre Cardin emblem or name included in full. A wide selection of colour options sees the tastes and individual personalities of all trend-aware men and women catered for.